Hong Kong PSi Tower, way out of scale with the other buildings in Hong Kong? Danny Cheng: "What's that? is he trying to block the entire skyline here in Hong Kong? lol~~"
Dezeen: "British Hong Kong based designer Michael Young has been commissioned to develop building project strategies for Wanchai Cultural District. 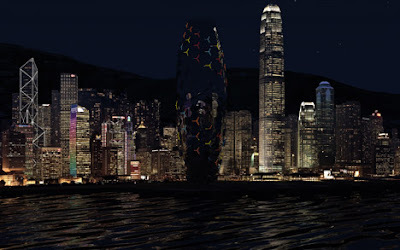 The first concept PSi Tower has been developed as an office complex with luxury apartments for business users and executives overlooking Kowloon district. Conceptually the project, based visually on the essence of ancient Chinese building techniques, has been carried forward into the 21st Century with its multi facetted surfaces that change according to weather and light conditions. The 5-hectare site will include a ground level internal atrium for public art and pedestrian use, containing outdoor restaurants with outdoor seating. The upper central interior section also boasts a native plantation that encloses an outdoor theatre area. Having lived in Hong Kong for several years, Young wanted to design a building that could be both understood by local residents and also be compelling on an international platform. Young, who has humorously stated he wanted to pickle Fosters Gherkin at the unveiling in Wanchai cultural centre today, admitted it was a great pleasure to work on such a large scale after watching great architects challenge the furniture industry over the years, and that finally the industry was becoming symbiotic a natural evolution of technology and engineering. Detailed information on the project will be unveiled at presentation and public exhibition during 100% Design Shanghai in early November at Nanjing West Road. Local Architect: Arnold Woo & Partners"
Danny Cheng: "Sweet, this is good news, good move Nokia :)"
Engadget: "Now this, this is what we call exciting. 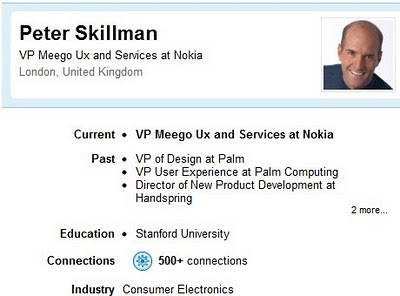 Nokia has managed to scoop up Peter Skillman from the wreckage of the HP/Palm merger. One of the many senior VPs to leave Palm upon its assimilation into the HP empire, Peter spent 11 years with his previous employer and was in charge of the design team that produced the deliciously curvaceous Palm Pre. Now at Nokia, he'll be heading up the user experience and services division for MeeGo, which means that if you weren't excited for the platform already, you've now got a very good reason to be."